Tú estás aquí: Inicio / Projects / Heikinkatu Bridge, Finland – Bridge of the Year 2018! We are delighted to announce that the Heikinkatu Bridge in the city of Oulu has been named ‘Bridge of the Year 2018’ in Finland, a title awarded by the Finnish Association of Building Engineers! In 2017 edilon)(sedra installed its Corkelast® Embedded Rail System (Corkelast® ERS) on this state-of-the-art railway bridge. The 2018 jury deliberated on upgrading, reinforcement or monitoring system projects conducted on bridges in Finland. According to the jury, the aesthetics of the Heikinkatu Bridge have been taken to a new level. The bridge and heavy railway tracks were upgraded and expanded (2 –> 3 tracks) in a highly challenging environment. Overall, cooperation between the various project parties was a great success. The upgrading project was completed in 2017 meeting the set deadline and causing hardly any disturbance to railway or road traffic. 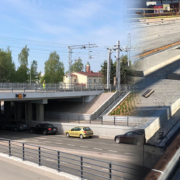 To overcome the challenges posed by the very limited available structural height, the Heikinkatu Bridge was designed with a concrete deck in which the rails were installed by means of Corkelast® ERS. This resulted in a structural height of only 0.72 m. The upgrading of the bridge was commissioned by the Finnish Transport Agency. Engineering services were executed by Ramboll Finland in cooperation with edilon)(sedra. The aim of the Bridge of the Year competition is to pay tribute to sustainable bridges and those operating optimally, and to enhance the quality of bridges. The Bridge of the Year title has been awarded since 2001.
https://www.edilonsedra.com/wp-content/uploads/2018/08/Oulu_Bridge_slider.jpg 426 1022 edilon)(sedra https://www.edilonsedra.com/wp-content/uploads/2014/01/logo.png edilon)(sedra2018-08-06 09:47:272018-08-27 10:11:37Heikinkatu Bridge, Finland - Bridge of the Year 2018!